This one's gotta hurt ... 50 Cent's estranged son Marquise has a new father figure in his life and it happens to be his biological dad's worst enemy. 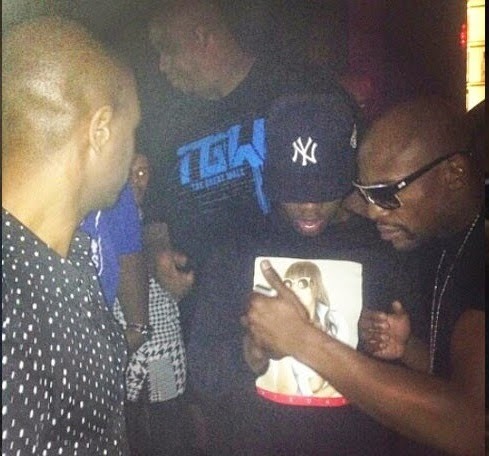 Marquise posted a photo to his Facebook page .... hangin' with FLOYD MAYWEATHER!! Unless you've been living under a rock, you know 50 and Floyd hate each other's guts so for Marquise to post this pic -- clearly, he's trying to get under his father's skin. 50 and Marquise have a complicated relationship -- 50 hates Marquise's mother and hasn't really been a part of Marquise's life, something Marquise admits he's very upset about. Now, it seems like things have gone to "Hook" Levels, with a public war for Marquise's affection. So far, 50 has yet to post anything about it on his Instagram but we're guessing it's only a matter of time.